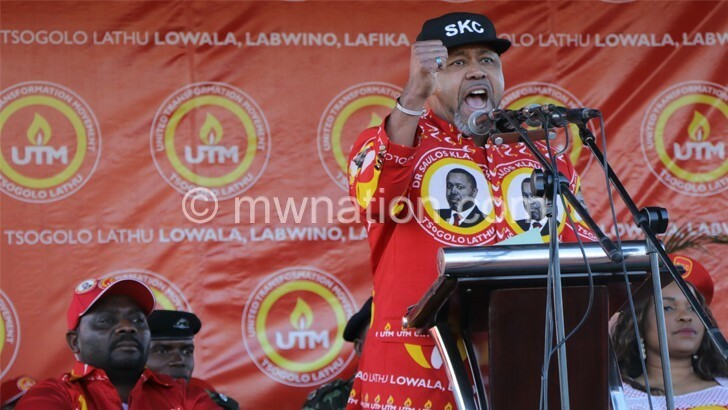 Malawi’s Vice-President and president of the new party UTM, Saulos Chilima, on Sunday attacked Malawi Energy Regulatory Authority (MERA) over the latest fuel price hike and demanded a proper explanation and a reduction. Chilima made the demand during a political rally that UTM held in Karonga district where thousands attended to listen to the party leaders as they unpacked their vision for Malawi. The country’s second-in-command said MERA had no justification of effecting the latest fuel price hike because the global oil prices have gone down this week, saying the hike is politically motivated. “We know the kwacha has gone weaker against other currencies but increasing through prices is not the answer to solve the kwacha’s depreciation on the market hence they should not lie to us,” said Chilima. Under the new price structure, a litre of petrol is fetching 6.2 percent more from K932.50 to K990.50, diesel has gone up by 6.9 percent from K935.60 to K990.40 and paraffin is now selling at K785.80 from K735.30, a 3.93 percent hike. Mera chief executive officer Collins Magalasi said the effect of the downward trend in world oil prices can only be considered at the next petroleum pricing review meeting as Malawi considers “the one month-minus-one mechanism” which entails that developments in a previous month when the product was bought determine the prices. But Chilima condemned the pump price increase, saying it would push Malawians into more misery with the rising costs of goods and services. The UTM leader observed that it was strange to note that Malawi is the only country where fuel prices are increasing upwards despite falling fuel prices in the rest of the world. “I’m a person who prides myself on speaking the truth so if there is anyone who wants to oppose my views they should please go ahead but fuel prices should be reduced, this is not an issue we should be wasting time arguing o, just reduce those prices right now,” Chilima said. He warned that if the prices of fuel are not reduced as demanded, there will be some “plan of action” to be taken. This is the second fuel price increase in just four months. In July the price of fuel went up by the same margin. In his speech, Chilima promised that once he becomes Head of State, Karonga, the border district with Tanzania will be elevated to a city status. Chilima further promised Karonga residents to promote Kilombelo rice as well as fish by finding export markets. The UTM leader maintained that if elected as President next year, he will seal loopholes leading to the loss of billions of kwacha from public coffers. He said there I more rot in the Democratic Progressive Party (DPP) administration he has served as Vice-President since 2014. Chilima also said if he is elected president, he will review some laws regarding the appointment of the Anti-Corruption Bureau (ACB) director so as to make the bureau independent from political interference. On UTM plans for the country, he reiterated that it will create 1 million jobs within a year as well as improve the nation’s education and health systems. The second citizen said UTM is serious and will field candidates in all positions including ward councillors and members of Parliament in 2019 tripartite elections. Speaking earlier during the rally UTM secretary general Patricia Kaliati said she was delighted with the high turnout saying it shows people’s trust for Chilima. Chilima initially launched UTM at Masintha Ground in Lilongwe in July following a sour relationship with the DPP which forced him to resign from the party. Chilima don’t take advantage of people’s ignorance if you yourself understand how things work. All countries in the world pay the same price for fuel on the world market. However, the price of fuel differs depending on the situation of each country and what sort of taxes are imposed on fuel. I would like to believe you know the truth, but because it is politics you want to side with the masses all for votes. Unfortunately Chilima is lying . Fuel prices per LTR at filling stations globally are high. Very high in fact in the UK a LTR of Petrol in a space of a year has increased by 15%. Nothing to do with taxes more to do with oil companies not being allowed to buy cheap iranian fuel after the ban from America. You are right the weakening of Kwacha cannot be corrected by raising fuel price. And that’s not what MERA has done. But the weakened Kwacha means you now need more kwachas to produce same amount of Dollars to procure fuel. If you don’t do this by maintaining prices it means the Kwachas which you get can only buy lesser fuel and that’s recipe for fuel scarcity. If international prices are going down fuel prices could only go down if both inflation and exchange rate are constant. You are absolutely right and Chilima was to understand this better than anybody else.That’s why I have never been attracted to this dude from the word go,he is just to be seen as if he will make a difference. Get it, right Boss! the point here is deal with the weakening of the Kwacha so that either price remain or reduce because generally, World prices have slumped. Deal key economic fundamentals to tame weakening of the Kwacha! Please lets talk about Malawi, we are not in India neither can we compare ourselves with them. Malawi is miles apart from Physically and Economically. Iwenso Gome opepera eti? Kanjedza wapereka chitsanzo cha dziko la India chifukwa chitsiru chinzako ka Chilimako kanena za world fuel price and India is part of the world. Snatanthauze kuti ndiife ma Indians ai, ndipo ndibwerezenso, Kanjeza wapereka chitsanzo and it does not mean that we are Indians. Bwampini muzimvesetsa zinthu. This is very disappointing! Should our country raise fuel prices bcoz other countries are doing it? Is it not possible to manage our economy and arrest these fuel price increases? why are we not good at some of our measures on strategic commodities like fuel? Let’s admit we are simply not good for this job! MALAWI AMENEYO !! PITALA AMENEYO !! ALIBE POLOBOLEMU !! KAMUZU COULDN’T ALLOW THIS NONSENSE TO HAPPEN UNDER HIS WATCH !! A LEADER SHOULD STAND UP FOR THE POOR MASSES !! I was there in 1984 when Kamuzu substantially raised fuel prices. Tiye nawo asakhwiwa atidyela kokwanila. Mafuta akutchipa pano choti akwezele ndi chani panopa? Even atakhala kuti afika $1 a barrel sangatsitse be apumbwa amenewa. Malawi sadziwa kutsitsa koma kukweza basi.